Case Buy of 12 boxes. 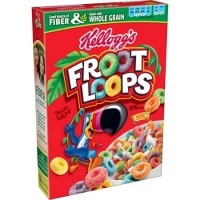 If you watch American TV shows, you will have undoubtedly heard of Froot Loops, which are unquestionably the most famous breakfast cereal in the United States. Millions of people in America start the day with a bowl of Froot Loops. 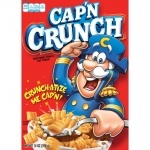 While there is now a UK version of this popular breakfast cereal, the taste and ingredients are a lot different to the American version, so the two should not be confused. The genuine American Froot Loops cereal is tasty, nutritious and a fun breakfast that is great for kids and adults alike. 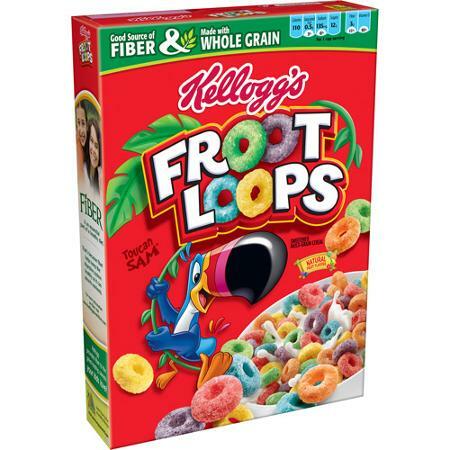 This large (17 ounce/481 gram) box of Froot Loops is enough to give every member of your family a bowl in the morning for several weeks, and, at such a low price, it represents really good value too. 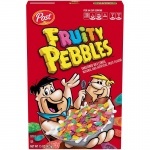 If you are bored with your typical breakfast cereal, you want to give the kids a treat, or you want to try genuine American Froot Loops, this product is for you. Made from sweetened multi-grain, you get plenty of vitamins, minerals and fibre in this breakfast cereal, so it provides everything you need to start the day. Sugar, Corn Flour Blend (Whole Grain Yellow Corn Flour, Degerminated Yellow Corn Flour), Wheat Flour, Whole Grain Oat Flour, Oat Fiber, Soluble Corn Fiber, Contains 2% Or Less of Partially Hydrogenated Vegetable Oil (Coconut, Soybean And/Or Cottonseed), Salt, Red 40, Natural Flavor, Blue 2, Turmeric Color, Yellow 6, Annatto Color, Blue 1, BHT For Freshness. Vitamins And Minerals: Vitamin C (Sodium Ascorbate And Ascorbic Acid), Niacinamide, Reduced Iron, Zinc Oxide, Vitamin B6 (Pyridoxine Hydrochloride), Vitamin B2 (Riboflavin), Vitamin B1 (Thiamin Hydrochloride), Vitamin A Palmitate, Folic Acid, Vitamin D, Vitamin B12. Contains Wheat Ingredients. Corn Used In This Product May Contain Traces of Soybeans.